The following news appeard in Deccan Herald on 7th October, 2011. The news talk about the Offial emblem of Karnataka. 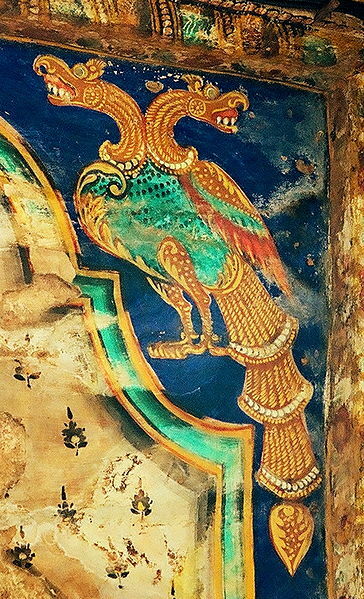 Gandaberunda, the mythical bird formed the royal emblem of the Wodeyaar Kings of the princely state of Mysore, in Karnataka. news says that the emblem completed 500 years history. 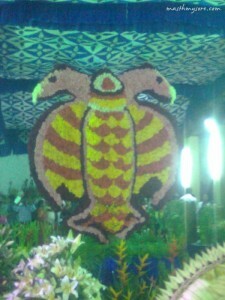 The news item tells that though the 400th year of Dasara, which was tipped for the most grand celebrations, failed to live up to its expectations, the 500th year of adoption of Gandaberunda got a floral celebration, with a 10 ft flower model of the imaginary bird put on display at Dasara flower show here. Historian Prof P V Nanjaraje Urs, who has done a wide research on the Mysore State, tells that the Gandaberunda was first used as a sign on coins in Vijayanagar mints, many of coins which still exists. Since then, the tradition passed on to generations. In mid 16th century, history has it that Yaduraya embarked on a Vijaya Yathra across the Mysore State to consolidate their rank. During the Yathra, an ascetic encountered and gave him a red cloth. The King offered pooja to it and accepted it as a blessing. He won all acclaim thereafter. Karnataka ruler announced red cloth as Rajdhwaja or State flag. To add the principles of dharma and sathya, the flag got a slogan as “Sathymevodhbhavaramyaham” with imaginary bird Gandaberunda. 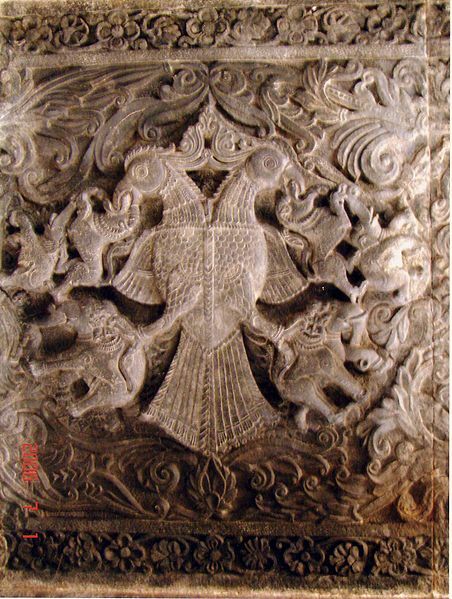 The bird was surrounded by elephant headed lion on two sides and a lion carrying Mahishasura’s head on the top. The mythology has it that Gandaberunda and sharabas(elephant headed lion) adjoining it are a union of a strength of Lord Shiva and Lord Vishnu. When Lord Vishnu took Narasimha Avathar to kill Hiranyakashyap, father of his devotee Prahlad, his anger simmered even after Hiranyakashyap’s death. The entire universe, including the Gods and Goddesses went into a tizzy and wanted Lord Shiva to intervene. Means emblem stands for Vishnu. Dravid ( people who are follving Vishnu like Druv) people remembers this ancient emblem. They trust in this emblem. Now look at the picture of emblem of Holy Roman Empire . The emblem is outcome of ancient Druid priest tradition of Europe. The emblem does not carry the tradition of Vishnu ? The double-headed eagle is most commonly associated with the Byzantine Empire. and the Holy Roman Empire established by Merivingian kings. 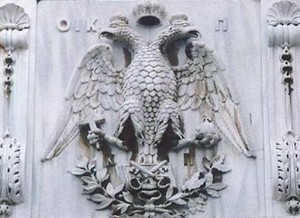 In Byzantine heraldry, the heads represent the dual sovereignty of the Emperor (secular and religious) and/or dominance of the Byzantine Emperrors over both the East and west. If you look at the emblem of Ayuthya kingdom of Thailand , then the kingdom also carry this sort of Emblem. This mysterious emblem is clue to world history. The Gandaberunda (also known as the Berunda) is a two-headed mythological bird of Hindu mythology thought to possess magical strength. It is used as the official emblem by the Karnataka government and it is seen as an intricately sculptured motif in Hindu temples. The mythology says that the Ganda Berunda took physical form in the Narsimha (Man-Lion) incarnation of Vishnu. After Narasimha has slain the demon Hirankashyap, through the taste of blood, Narasimha did not let go of his dreadful form and the demigods were even more afraid from the supreme lord now, than before the demon. Shiva, the best friend of Vishnu, thus incarnated himself as Sharabh, a part-lion and part-bird beast. With his Wings, representing Goddess Durga and Kali, he embraced Narasimha and pacified him. But out of Narasimha (Vishnu) emerged an even more fearful form: Ganda Berunda, having two heads, fearful rows of teeth, black in complexion and with wide blazing wings. The destructive energy of Narasimha (Vishnu) in the form of the two-headed bird, began to fight fiercely with Sharabha (Shiva) for eighteen days. ), Vishnu stopped the fight, and Sharabha easily tore apart the two-headed bird. Narasimha (Vishnu) himself displayed now his peace, and Shiva finally transformed back in his usual form. Now look at facts about “Gundestrup Cauldron” of Iron age Europe.Gundestrup Cauldron is symbol of La tene culture (Lal Tibba Culture?) wikipedia gives detail about it. I am haere providing link to facts. It is signals clue between Bahartvarsha and Europe. A cauldron or Katarmal “ ? The word cauldron is first recorded in Middle English as caudroun (13th c.). It was borrowed from Old Northern French or Anglo -Norman caudron (Nornam -Picard caudron, French chaudron). It represents the phonetical evolution of VUlgur Latin *caldario for Classified Latin cald?rium “hot bath”, that derives from cal(i)dus “hot”. The deity of the sun temple in Katarmal is known as Burhadita or Vraddhaditya (the old Sun God). The temple, noted for its magnificent architecture, artistically made stone and metallic sculptures and beautifully carved pillars and wooden doors, has a cluster of 44 small, exquisitely carved temples surrounding it. Katarmal is 800-years old Sun Temple. The main deity of the Sun temple is commonly known as “Baraditya” facing east. This is the biggest temple in Kumaon region. This temple was built by Katarmal, the medieval king of Katyuri dynasty.